Ann & Ariel | Parent Portrait | Kids VT - small people, big ideas! Ann Mindell plays drums in the Nancy Druids, the band she formed with her husband, Sean Toohey. 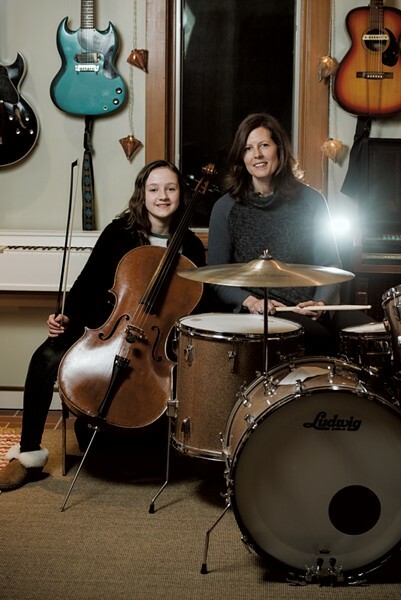 Their daughter, Ariel, is an accomplished cellist who plays with Vermont Youth Strings, part of the Vermont Youth Orchestra Association. Ariel, how long have you been playing the cello? Ann, when did you start playing music? Ann, 49: I started playing classical music when I was young but came to the drums by accident, really, when I was in my mid-twenties. Do you play together as a family? Ann: Yeah. Ariel actually played a show with us at Radio Bean. Ariel: That was great. Everyone liked it a lot. And more people came than at their usual shows! My dad wrote a ton of songs, so I played on a couple of those. Do the two of you like the same music? Ann: It's sort of a range. Father John Misty, old stuff like Sonic Youth, of course Neil Young. Led Zeppelin is always on my Pandora. Do you try to get Ariel into any of your favorite music? Ariel: She'll be like, "Ariel! Listen to this!" And she'll turn up the volume, like, five notches!